Shearwave transducers are a single or dual element device mounted on an angled wedge, and are typically used to introduce a refracted shear wave into the test material and can be purchased in a variety of fixed angles. improve detectability of flaws in and around welded areas. 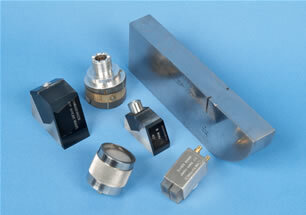 They can also be produced to generate surface waves for use in detecting defects on the surface of a component. Normal incidence shearwave transducers allow the user to introduce a sound wave into the test piece at an angle with minimal longitudinal wave refraction. All elements are available in rectangular or round format and can be manufactured to suit the customer’s specification. Inspections of tubes, pipes, weld defects and cracks, castings and forgings.